You need to log in to sign up—and you'll need to log in to access the online event, so now is the time to make sure you can! If you don't have an SAA website account yet, set up your website account here. Parents as Partners Online launches January 15, 2019 with over 50 video, audio, and transcribed talks for parents and teachers. 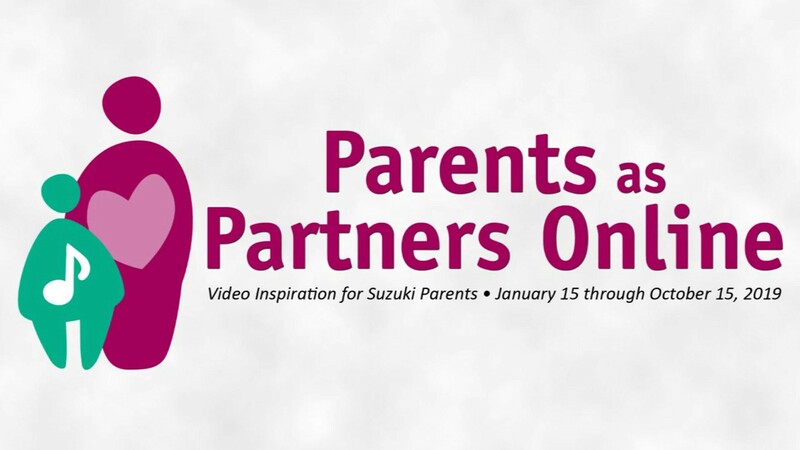 This series of short online videos for Suzuki parents and teachers will address such Suzuki-related topics as parent-teacher communication, the teen perspective, character development through music, and many practice games for all! Register now to gather fresh ideas on numerous Suzuki-related topics! We’ll email you on Tuesday, January 15 with instructions on how to access Parents as Partners Online. New video lectures will be added each Monday, and we’ll email you then too. Videos can be watched on any web-enabled device: desktop and laptop computers, smartphones, and tablets—including iPhones and iPads. Audio only “podcast style” versions can be accessed by clicking the “Podcast” button at the top of any Parents as Partners Online page. Once posted, all videos can be watched online at any time until October 15, 2019.